Hard boil eggs: (test kitchen directions) : Bring eggs, 1T salt, and 2 quarts water to a boil in a medium sauce pan over high heat. As soon as water boils, remove pan from heat, cover, and let sit for exactly 10 min. Meanwhile, prepare a bowl of ice water. Transfer eggs to ice water and let cool for 5 min. Potatoes: Place in large pot with 1/4 tsp salt. Cover with water. Bring to a boil, reduce heat and simmer for 25+ min until tender. Drain, cool, peel and cube. In a large bowl, combine mayo, mustard, 1/2 tsp. salt and 1/4 tsp. pepper. Stir in celery, onion and pickle. Add potato and egg. Toss lightly to coat. Cover and chill for 6-24 hours. Serve in a bowl and sprinkle with paprika if desired. 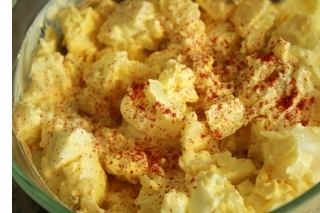 One Response to "Potato Salad"
Sounds like you have an amazing sister-in-law!